Significance : Dedicated to St. Catherine of Alexandria; houses the Golden Bell used during the Goa Inquisition. The Se Cathedral Church is dedicated to St. Catherine of Alexandria. This church is considered to be the largest in Asia. The Portuguese built this splendid structure in the 16th century. 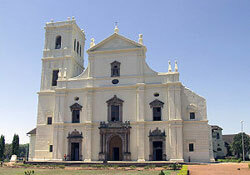 The Cathedral stands towards the west of the great square called Terreiro de Sabaio and has its portico facing the east. Its beautiful and attractive patio is accessed by a flight of steps. The architecture of the Se Cathedral is typically Portuguese in style with a Tuscan peripheral and Corinthian core. The church is approximately 250 ft in length and 181 ft in breath. The frontispiece stands at a height of 115 ft.Originally, there were two towers, on either side of the facade, but the one on the southern side plummeted in 1776. The exterior of the Cathedral is noteworthy for its plain style, which is typical of the Tuscan institution. The fallen bell tower was never rebuilt and has given the building an exceptionally charming look. The Se Cathedral is famous for its five massive bells. The existing tower houses a famous bell, 'Golden Bell' which is one of the largest in Goa. On account of its melodic tone, it has been commemorated in a Portuguese poem. The main altar is dedicated to St. Catherine of Alexandria. Old paintings on either sides of the altar portray scenes from her life and martyrdom.